Cookie dough is SO hot right now. Actually, no it's not. 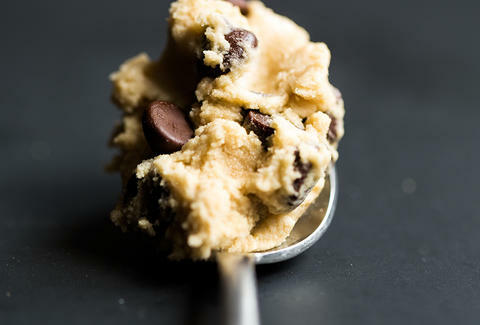 Hot cookie dough is just a cookie. Still, you've probably heard about the New York dessert shop that's making safe-to-eat dough. That should inspire you to make your own batch, then sit in a dark room until all that's left is regret. Then get super sick. That's mostly because of eggs and all their delicious salmonella. But raw flour apparently contains more bacteria than the ball crawl at a Chuck E. Cheese's next door to a hospital. There's a solution, though. A real simple one. The folks over at POPSUGAR unearthed a recipe from Sprinkle Some Fun containing a nice little hack to get around that whole "searing stomach pain" thing: Just microwave the flour. Once it hits 160 degrees, those terrible bacteria are nuked to oblivion. Then, just make your own dough and eat to your heart's content. That hack, by the way, isn't just cookie-specific. You'll be free to eat everything from cake batter to bread dough… if you're a monster. Just be sure to save a little so you can bake a cookie or two. If you don't, you've got another option: Just grab some Ben & Jerry's and bake that. Trust us, it works! Andy Kryza is a senior editor at Thrillist whose views on rawness mirror that of philosopher/poet Dirt McGirt. Follow him to the 37th Chamber @apkryza.